Bombay mix is a familiar spicy snack to many, and was discovered by the British in the days of the Empire. 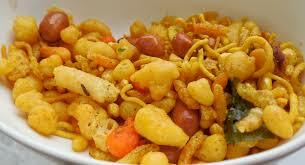 It was named Bombay mix as it was found in Bombay, which is now known as Mumbai on the west coast of India. Mumbai, an old city which was originally a cluster of islands. It has become an incredibly popular snack since it was introduced to Britain and it is now consumed all over the world. However, it is known by different names and is only called Bombay mix in Britain. It is known as chevda in India, and was first, created to be prepared at home and consumed during festivals between meals. 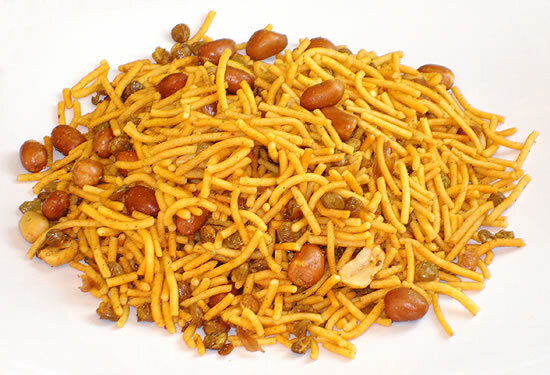 In the US it is known as Punjabi mix, and although it is generally called chevda in India, in Mumabi it is known as chuda and as chanachur in Bangladesh. The Australians have given it the name Bhuja mix, and in Sri Lanka it is simply called mixture but is much loved. Mumbai, the most wealthiest & glamorous city in India. The different names all point to a similar recipe, but in India it is part of a family of snacks and other varieties normally include ingredients like dried raisins, which are never usually present in the snack known as Bombay Mix in Britain. A traditional Bombay mix also varies and most families have their own versions. The main difference tends to be whether to flatten rice or puffed rice or noodles (sev) made from gram flour (chickpea flour)are used. Even the type of noodles has an impact on the snack, as some people prefer the effect of using thick noodles while others like to use the thinner variety. Generally the normal ingredients are always dried and include fried lentils, peanuts, cashews, gram flour noodles, corn, vegetable oil (ghee), chickpeas, flaked rice, and fried onion. The seasoning is very pungent and strong;it is made from combining ground cumin, ground coriander, turmeric, chilli powder, mustard seeds and plenty of salt. Although most people who consume this delicious snack outside India do so from a packet purchased from a local shop, traditionally it is made by hand. It is a time consuming process and very labor intensive. If noodles are used they are formed using a perforated brass utensil known as a seviya. The thick mixture of chickpea flour, oil, spices and water is passed through the seviya into vats of hot oil to fry –this gives the snack its famous crunchy texture, and although it can often be found in health food shops, the frying process does mean it isn’t necessarily a healthy option. The time taken to prepare the snack is always worth it, however, as the finished result is delicious and a very different experience to the shop brought variety. Some serene hill stations near Mumbai city. The chefs at traditional fine dining Indian restaurants in the heart of London expertly craft a fresh homemade Bombay mix, which contains the ideal combination of spices along with a delicious crunch. Nibble on this delicious snack and savour the rich flavors while you select your perfect meal from the wonderfully wide-ranging menus on offer. Mahabaleshwar: a virginal-pious town offering best tranquil holidays. Matheran – a beautiful, pollution free hill station of Maharashtra.